Vishwankar Public School, Coimbatore has advertised in THE Hindu newspaper for recruitment of Teachers jobs vacancies. Interested and eligible job aspirants are requested to apply immediately.Check out further more details below. 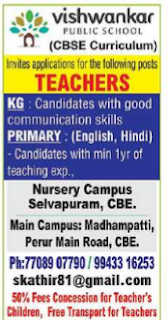 Name of the School:Vishwankar Public School, Coimbatore. (b) Good communication skills & Knowledge in computers preferred. Salary not a constraint for deserving candidates. How to Apply: Apply with latest resume & photo. Reference: Advertisement on THE Hindu Newspaper dated on 27th May 2018.